Gallia Academy junior Emmanuel Valadez (17) controls the ball along the sideline during the first half of Thursday night’s OVC boys soccer match against Fairland at Lester Field in Centenary, Ohio. CENTENARY, Ohio — Just enough to stay unbeaten. Freshman Brody Wilt scored two goals — including the game-clincher with just over 20 minutes left in regulation — to help the Gallia Academy boys soccer team remain perfect this season during a 2-1 triumph over visiting Fairland on Thursday night in an Ohio Valley Conference match at Lester Field in Gallia County. The host Blue Devils (5-0, 3-0 OVC) never trailed and built a 1-0 intermission advantage, but the Dragons continued to battle before tying things up early in the second half. Deadlocked at one, Wilt had a free kick at the top of the box from 18 yards out. Wilt launched his shot and found the back of the net in the 58th minute, pushing GAHS ahead by a 2-1 count. 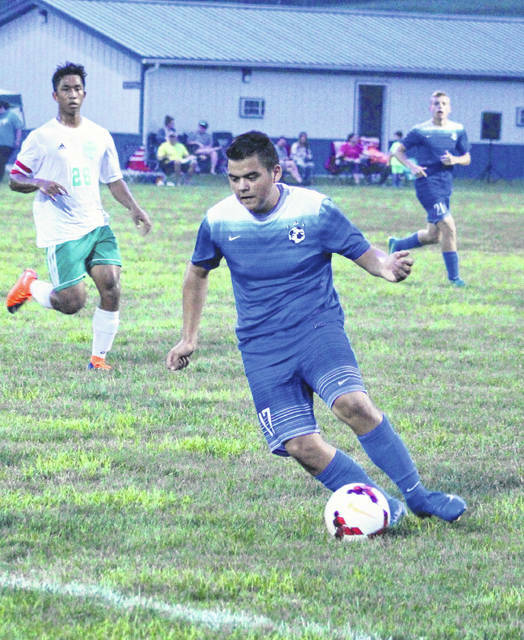 The game itself — which featured at least one yellow card for each squad — remained tightly-contested the rest of the way, but the Blue and White ultimately held on to pick up the one-goal triumph. Wilt came away with the only goal in the opening half after a right-footed blast found the back of the net in the 27th minute. FHS (1-3, 1-1) countered with a score in the 53rd minute after Jesse Lewis buried a penalty kick that knotted the game at one apiece. The Blue Devils outshot Fairland by a 17-8 overall margin, including a slim 7-5 edge in shots on goal. Andrew Toler made four saves in net for Gallia Academy, while Christian Italiano stopped five shots in goal for the Dragons. The Blue Devils return to action Tuesday when they host Jackson in a non-conference friendly at 7 p.m.